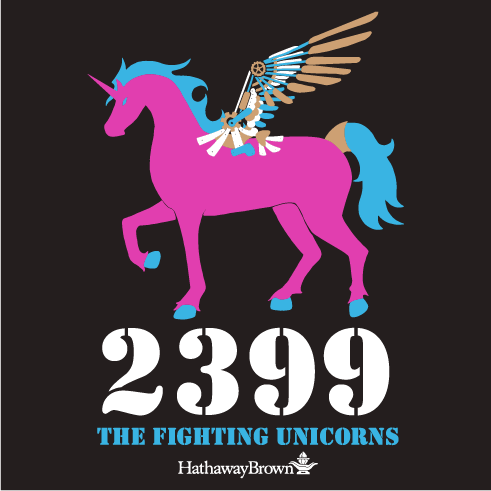 Hathaway Brown School is proud to announce that its Upper School Robotics team, the Fighting Unicorns, have qualified for the FIRST Robotics World Championship at the Buckeye Regional Tournament March 30-April 1. The event will be held in St. Louis on April 26-29. Partnered with the Beak Squad from Cincinnati Hills Christian Academy and the Robocats from Girard Senior High School, the Unicorns sailed through the quarterfinals and semifinals undefeated before losing to the eventual regional champion alliance in the finals, by scores of 305-313 and 307-317. The team also won the Xerox Creativity Award (celebrates creativity in design, use of component, or strategy of play) at Buckeye and the DELPHI Excellence in Engineering Award (celebrates an elegant and advantageous machine feature) at the Finger Lakes Regional. Mackenzie Bruce '17, Arielle Devito '17, Lauren Egts '17, Maggie Gehrlein '17, Alexi Jackson '17, Hanna Keyerleber '17, Rosalie Phillips '17, Chloe Schwartz '17, Sara Currier '18, Kshama Girish '18, Roshni Sharma '18, Kate Snow '18, Anna Sobolewski '18, Josie Carlson '19, Catherine Liu '19, Alison Xin '19, Vedhasya Muvva '20, Layla Najeeullah '20, Rebecca Oet '20, Abby Sobolewski '20, Neha Devireddy '20, Alia Baig '20, Linda Yu '20. Show your support and help the Fighting Unicorns raise money by purchasing a special t-shirt by Sunday, April 9. The Hathaway Brown School Robotics Team, FRC Team 2399, was formed in 2007. It is the only all-girl FIRST Team in Northeast Ohio.